Indie DVD producer John R. Ellis is to be congratulated and thanked for the incredible job he and his associates have done rescuing the good but heretofore forgotten television series Steve Canyon (1958-59) from oblivion. Adapted from Milton Caniff's 1947-1988 newspaper strip, the TV version only ran one season, too short to be repackaged for syndication. It was quickly forgotten, except by fans of Caniff's work, and by those with fond memories of this unusual, often very good but short-lived show. Ellis and others, however, were determined not only to get it released to DVD, but also to do the series justice. They went back to the original 35mm broadcast masters (often including "bumpers" and original network commercials), which look great, and supplemented releases with scads of extra feature content including, in this case, commentary tracks for every show. But funding such a massive, self-financed undertaking proved difficult. The first two volumes, containing the first 24 of 34 episodes, were released in November 2008 and May 2009, but it took more than six years for Ellis and his team to complete Steve Canyon, Volume 3. That's an awfully long time, but the wait has been worth it. The last 10 episodes generally look great, and this two-disc set also includes the original 1958 pilot film and DVD-ROM content that includes Project B-58, an unproduced teleplay. Further, in a very nice little touch, Ellis is making available an attractively designed cardboard sleeve in which collectors can store all three DVD cases. Lt. 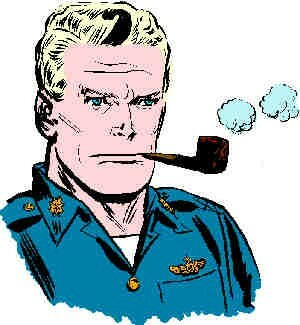 Colonel Steve Canyon (lean Dean Fredericks, who resembles Caniff's drawings quite closely) is an experienced jet pilot with the Right Stuff. During the first half of Steve Canyon's single season, the U.S. Air Force was eager to cooperate with the show's producers, figuring Caniff's idealized airman would encourage enlistment and good will about that branch of the Armed Forces. They provided the show's producers a level of access to real hardware and military footage unprecedented for a television series. Early on, Canyon was on assignment all over the world, often testing some fantastic - but genuine - Atomic-Age hardware. The mixture of carefully edited stock footage with Fredericks and various guest stars interacting with the real hardware (or on carefully recreated sets) was both very convincing and visually impressive, even amazing at times. However, the Air Force brass took strong exception to the show's fact-based scripts, which depicted the pilots (other than Canyon) as something less than Greek Gods, and the pricey hardware they flew as considerably less than infallible. The Air Force just didn't get it: they thought the show was criticizing the service's weaknesses when in fact it was dramatizing its main strength - the ability of well-trained but ordinary men to overcome the extreme hazards of brand-new, often untested technologies through perseverance, ingenuity, and a whole lot of bravery. On episodes in Volume 2 of the DVD sets, the show's writers and producers were clearly at a loss, what with the Air Force suddenly pulling the plug. They had Steve taking command of Big Thunder, a fictitious air base apparently based on Edwards AFB in the Antelope Valley north of Los Angeles. At this point, the show really turns a corner. It's like the Air Force took away all their toys. Instead of scenes around and aboard real aircraft, they must make do with flimsy-looking plywood props representing jet fighters: usually the nose or the tail, with the rest of the plane obscured by a big boulder or enormous bush. By the time of the episodes contained in The Complete Steve Canyon on TV Volume 3, however, the series managed to bounce back in most respects and, ironically, in the process began to resemble the strip more than the earliest and mid-season episodes while keeping the tone adult and never really a kid's show per se. There's still a dearth of authentic Air Force hardware, and in some of these last episodes Steve never gets anywhere near a plane at all, except off-screen, but these final episodes are a big improvement over the Volume 2 shows. Stories are all over the map but, most of the time, the writing is surprisingly effective and compelling. I particularly liked "The Bomb," in which a group of children trespass onto base grounds and stumble upon an unexploded bomb they think would make a swell addition to their clubhouse. The race to find and defuse the bomb before the kids are blown to smithereens is unexpectedly suspenseful. Late 1950s television would surely have not permitted the death of these kids, but the writing (by John Hawkins) and direction (Walter Grauman) of this episode convinces the viewing audience that a terrible tragedy just might happen. "Operation Intercept," which aired a half-decade before Dr. Strangelove and Fail-Safe, is another real nail-biter, about a B-47 bomber apparently out of control and headed for Russian air space, an episode that reportedly traumatized many March 1959 viewers. Several others likewise have their share of surprises, such as the bleak Cold War thriller "Iron Curtain," with Steve trying to help negotiate the return of a kidnapped girl from foreign spies. Karl Swenson, as the girl's freedom-fighting father, is especially good, as are Werner Klemperer and Celia Lovsky in supporting roles. Equally dark is "Blackmail," with Steve investigating the murder of an AFB war bride, the victim of a larger blackmail ring again perpetrated by foreign spies. 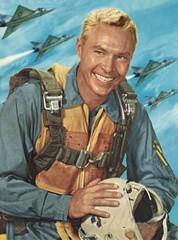 Though the series oozes with Eisenhower-era politics, it's not hysterically anticommunist in the Big Jim McLain mold and, to some extent, the lack of Air Force cooperation may have actually freed up some of Steve Canyon's dramatic potential, as witnessed in episodes like "The Korean Story," about a pilot haunted by wartime flashbacks, or "The Sergeant," which dares to suggest Air Force personnel didn't always get along with one another. Tall (6'3") and occasionally stiff in other roles, Dean Fredericks had a relatively short career of about 15 years; he seems to have quit the business around 1965, 34 years before his death at 75, but as Steve Canyon he's fine and anchors the show well through even the weaker episodes. It's also fun watching so many familiar guest stars at work, many at the very early stages of their careers. This set includes appearances by Jerry Paris, Ted de Corsia, Ross Martin, Roy Thinnes, Amanda Blake, John Anderson, Virginia Christine, Dabbs Greer, George Macready, James Drury, William Schallert, William Allyn, Claude Akins, Ron Ely, Harry Townes, and Paul Frees, among others. The Complete Steve Canyon on TV - Volume 3 is presented region-free in its original full frame format, on two single-sided, dual-layered, region-free discs. The black and white episodes look just great, and were mastered straight off the original 35mm broadcast master positives, with the exceptions of "Blackmail" and the pilot film, which were sourced from Caniff's personal 16mm prints instead, though they look just fine. Detail is superb and the contrast excellent. Though the series originally aired on NBC, some of the episodes have been sourced from ABC masters, where the show aired in reruns for a time (along with many other NBC shows). The audio is excellent; Walter Schumann's (Dragnet) memorable theme music sounds particularly strong. What's great about this is that not only do we get the show, but for some episodes also all the NBC or ABC network material used during the commercial breaks. All 10 episodes in this set include an audio commentary track. Actor Abel Fernandez and director Arthur Marks are featured, along with producer John Ellis, aviation film historian James H. Farmer, artist/historian Russ Maheras, actor and archivist Bob Burns, TV historian Peter Greenwood, and television historian Brad Ulvila. Also included is "Operation Towline," the unaired pilot version featuring an introduction by Caniff himself and alternate opening and closing titles, and the aforementioned unproduced teleplay in PDF format. The DVD box art is reversible; inside is an attractive full-color portrait of Steve Canyon, as well as a detailed episode guide noting director, writer, airdates, cast, a capsule summary of the plot and each episode's extra features. Congratulations to all involved for bringing Steve Canyon back. Overall the series is quite enjoyable on many levels, and the obvious care and attention to detail shine through every part of this package. A DVD Talk's Collector Series title.